Pumpkin Scone Recipe Archives - THE OLIVE BLOGGER - Recipes your family will love! Pumpkin season is in full swing guys, whether you like it or not, there is no way around it! I used to HATE pumpkin anything, there wasn’t a single thing I would eat if it had pumpkin in it…In my opinion they were just to be used on Halloween for carving and throwing away the next day! That all changed when I started to cook for myself and was able to play with the flavors to create a “spice level” that I could tolerate. This Pumpkin Scone Recipe is so easy and delicious, and is covered in a simple Spiced Cream Cheese Frosting that you can use on a number of other seasonal treats. I will be trying my hand at some pumpkin muffins and perhaps an apple fritter loaf just so I can lick the frosting from the bowl so I can bring you guys more delicious treats for my favorite Fall season!! A delicious Pumpkin Scone smothered in a Spiced Cream Cheese Frosting! The perfect Fall treat! Just looking at them again makes me want to lick my screen…who’s with me?! Now, the trick to these scones is really all in the making of the dough! You want to make sure you have everything ready to go ahead of time, no running back and forth trying to sort your ingredients! Don’t worry, we are all guilty of it! In fact, when I was remaking the recipe so I could update my photos I forgot the butter…LIKE HOW?! I had to start all over again and was exhausted by the time I was ready to take the photos! There have been too many times to count where I have had one part of a recipe ready and was throwing things in the fridge so I could run to the store for the 10 things I forgot (duh). Alright, ready for my tricks and tips for the perfect Pumpkin Scone Recipe!? Cover your countertop in plastic wrap (where you will be rolling the dough) trust me! And, if you don’t, check out my Overnight Cinnamon Rolls to see why!! 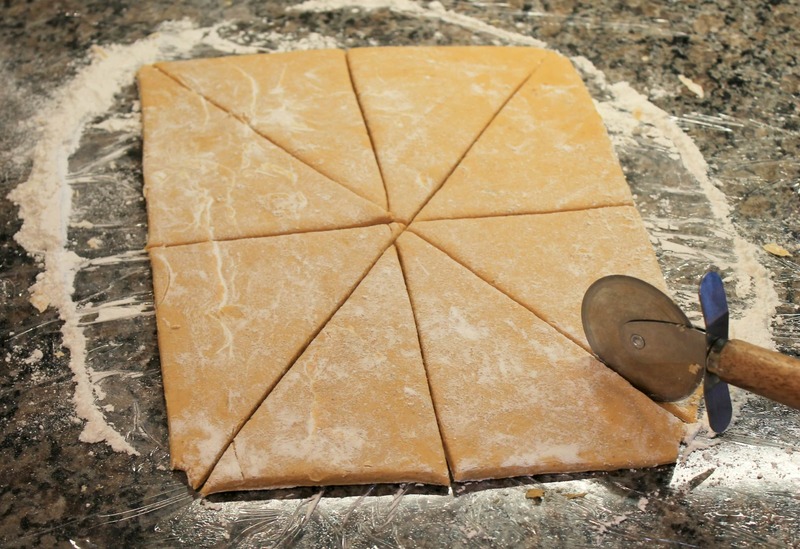 Use a pizza cutter to cut your dough into even triangles (I am all about multipurpose tools in the kitchen)! Place the scones into a sealed container (single layer) and put in the fridge to keep your icing fresh and yummy! Easy and Delicious Pumpkin Scones with a Spiced Cream Cheese Frosting - This recipe will become a favorite in your house and QUICK! Preheat your oven to 400 F and line a baking sheet with parchment paper (or baking mat). In your stand mixer, combine your dry ingredients for the scones. Add in your cold butter and mix on low speed until it combines with the dry to create small "pea" sized balls. 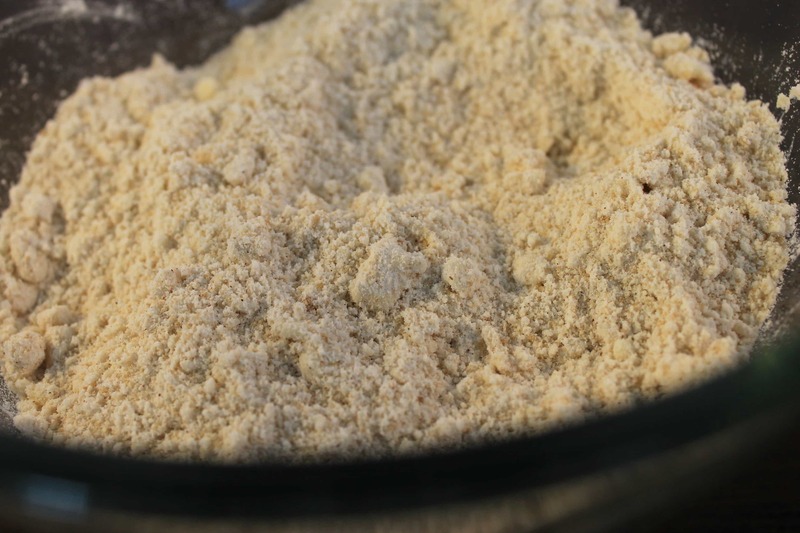 In a small bowl mix together your wet ingredients and add to your prepared butter/flour mixture. On a floured surface form your mixture in a ball and flatten with your hand to create a medium circle that is about 1" thick. Use a pizza cutter, or serrated knife, to cut into 8 scones, place on baking sheet and cook in oven for 15 minutes (they will be slightly golden around the edges). In stand mixer, cream together butter and cream cheese until soft and smooth. Add in sugar and spices and on low speed mix in the milk 1 tsp at a time until it reaches the consistency you are looking for (thicker for muffins and thinner for scones). Well there you have it guys! The recipe makes 8 good size scones, we cut some of them down even smaller so we could have mini scones (which are perfect with your morning coffee or tea!). See the pics below to check out the consistency of the dough and how we cut them using a pizza cutter! So, what recipes do you love using pumpkin and other classic Fall flavors?! Give this Pumpkin Scone recipe a try, you won’t regret it! 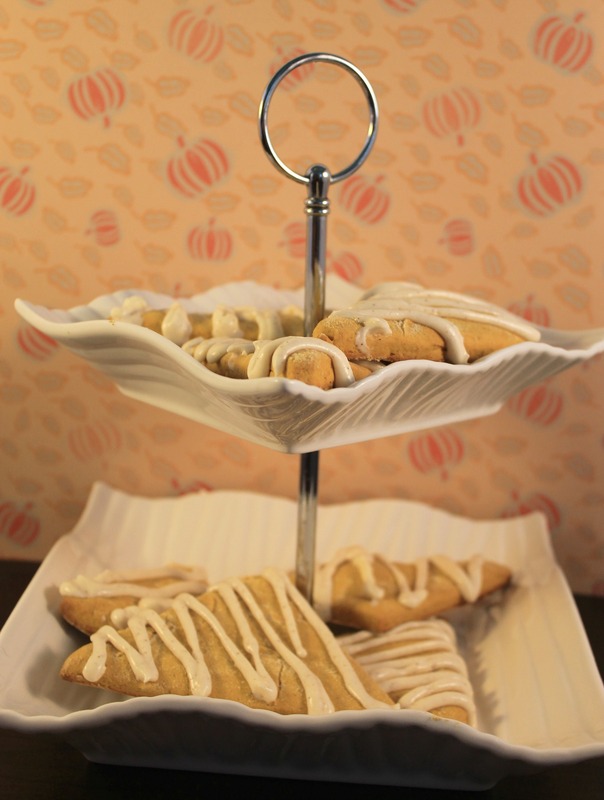 Looking for more recipes like our pumpkin scones?